In the tables and charts below, Hampshire County Hospital (also known as Winchester County Hospital) is referred to as ‘Hants County Hospital’. The following table shows the number of in-patients admitted each month in 1851 in three hospitals. The Dorset County Hospital data come from the admissions register. The Hants County Hospital data come from figures published weekly in one of three Hampshire newspapers (the Advertiser, the Chronicle or the Telegraph). 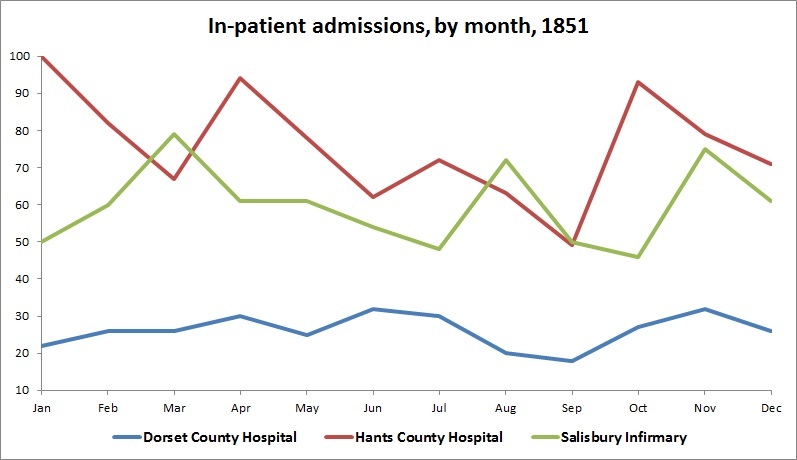 Similarly the Salisbury Infirmary data come from figures published weekly in the Salisbury and Winchester Journal. The following table shows the number of in-patient admissions during 1851 per 1000 of the population in the registration county. Note that registration counties are not exactly coterminous with historic counties. For instance, Lyme Regis in Dorset falls within the Axminster registration district and is therefore in the registration county of Devon. The data for the following table and chart come from the 1851 census. Hospital matrons in the 1850s were domestic housekeepers rather than senior nurses, and therefore they have been excluded from the nursing figures. Extracted from the Medical Times & Gazette, 24 March 1860, page 306 – it is likely that the figures relate to 1859. Name of Hospital. Annual No. of In-Patients. Daily Average No. in the House. Average No. of days each remained in the House. Actual Cost of each In-Patient. Cost of each In-Patient per day. Annual No. of Out-Patients. Cost of each Out-Patient. Bristol Infirmary 2344 220 35½ £3. 6s. 0d. 1s. 10¼d. 9211 1s. 11d. Salisbury Infirmary 956 93 35½ £3. 2s. 3d. 1s. 8½d. 1195 4s. 4d. Gloucester Infirmary 685 102 54 £4. 8s. 2d. 1s. 7½d. 532 4s. 9d. Hants County Hospital 912 118 47 £3. 16s. 8d. 1s. 7½d. 949 4s. 7d. The following table shows the number of patients in a range of hospitals in the south-west on census night (8 April) in 1861. It also shows the deaths registered in each hospital during the whole of that year. It has been compiled from tables in the Twenty-fourth Annual Report of the Registrar-General of Births, Deaths and Marriages in England (published in 1863). The mortality per cent calculation is the same as that used by the Registrar-General (see page 205 of the report): “The statement of the mortality of any One Hospital is qualified by the fact that the mortality is not deduced from the division of deaths by the average number of patients, but by the number on one particular day”. *Bath General Hospital was the mineral water hospital.